CSX Corporation (NASDAQ: CSX) reported a 20% jump in earnings for the first quarter of 2019 as its continued efficiency gains drove expenses lower. Merchandise volume growth and broad-based pricing gains lifted revenues up by 5%. The bottom line exceeded analysts’ expectations while the top line came in line with the consensus estimates. Net income climbed 20% to $834 million and earnings jumped 31% to $1.02 per share. During the quarter, the company recognized a $32 million tax benefit primarily due to impacts from option exercises and the vesting of other equity awards. Revenue rose 5% to $3.01 billion driven by merchandise volume growth and broad-based pricing gains. Expenses decreased 2% year-over-year to $1.79 billion, driven by continued efficiency gains. This combination yielded an operating income growth of 17% for the quarter to $1.22 billion compared to $1.04 billion in the same period last year. Looking ahead into the full year 2019, the company reiterated its revenue growth outlook of low single-digit and capital expenditures guidance in the range of $1.6 billion to $1.7 billion. Operating ratio for 2019 is still predicted to outperform 2020 target of 60%. For the first quarter, total merchandise volume rose by 3% helped by stronger waste, core chemicals, energy shipments, higher trucks and SUVs shipments, and gains in both the domestic and export grain markets. It also includes higher export demand for wood pulp and other fiber products as well as stronger building products shipments. Stronger shipments for construction and paving projects, as well as higher domestic steel production, helped in driving the merchandise volumes higher. Coal volumes increased by 5% as domestic coke, iron ore and other volume increased primarily driven by higher domestic steel production. However, Intermodal volumes declined by 5% as the rationalization of low-density lanes in domestic more than offset growth with existing customers. 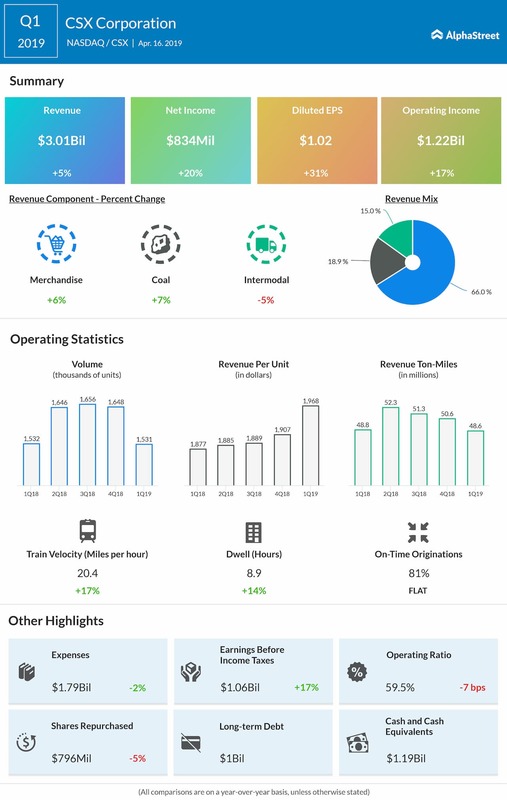 The company’s operating performance continued to improve in the first quarter of 2019, as train velocity and car dwell improved 17% and 14%, respectively, to all-time record levels. The company remained focused on executing the operational plan to deliver further service gains, improve transit times and drive-asset utilization while controlling costs. CSX’s peer Canadian Pacific Railway (NYSE: CP) is expected to announce its earnings on April 23 after the bell and the analysts view the company to post earnings of $2.32 per share. Another railroad operator Kansas City Southern (NYSE: KSU) is expected to post EPS of $1.44 when it reports the quarterly results on Wednesday. Shares of CSX ended Tuesday’s regular session up 0.03% at $75.89 on the NYSE. Following the earnings release, the stock inched up over 4% in the after-market trading.